The death toll from Sunday’s suicide attack against Christians in Peshawar continues to rise, the latest count reaching as high as 83 dead. The reaction to the bombing which came mere days after a Taliban bomb martyred Maj Gen Sanaullah Niazi has been one of visible shock. It’s almost as if many did not see this coming. But how? How could we be so blind? Over the past few days several writers have penned blistering critiques of Imran Khan and the narrative that has popularised which positions jihadi militants as ‘our estranged brothers’ instead of our killers. This gives the Kaptaan a bit too much credit. 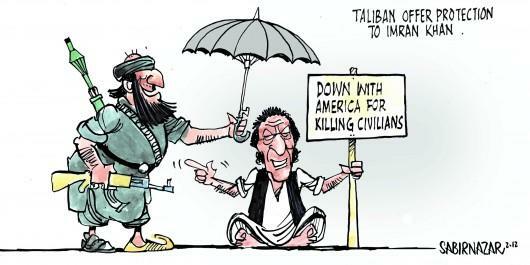 The pro-jihadi narrative did not begin with Imran Khan, and it does not end with him. Sheikh Rashid Detained. Is Imran Khan Next? Sheikh Rashid is well known for his boisterous personality and his attraction to the media lime light. Even those who do not agree with his politics often find him entertaining. The former minister has gone through a number of political transformations, though lately it seems that he has come full circle – and it appears that international authorities are taking notice. Last Wednesday, American authorities detained Sheikh Rashid for several hours as he was trying to return to Pakistan from Texas. Rashid was eventually permitted to leave, but only after his phones were confiscated and all data obtained by the American authorities. A clue as to why he was not permitted to exit the US can be found in the details of the Americans questions while he was detained. Speaking to journalist Azeem Mian, Rashid explained that the American authorities had interrogated him about his involvement with Difa-e-Pakistan Council. This is not the first time that Sheikh Rashid’s links to militant groups have caused problems for his international travel. In 2005, even as a federal minister Sheikh Rashid was denied visa to India to attend the Indo-Pak cricket series because of his previous support for militant groups in Kashmir. Gen (R) Mirza Aslam Baig confirmed that same year that Sheikh Rashid used to run a militant camp in Rawalpindi. During his tenure with the Musharraf regime, though, Sheikh Rashid reinvented himself as a supporter of Gen. Musharraf’s “enlightened moderation”. But it seems that Rashid has abandoned his support for moderation. 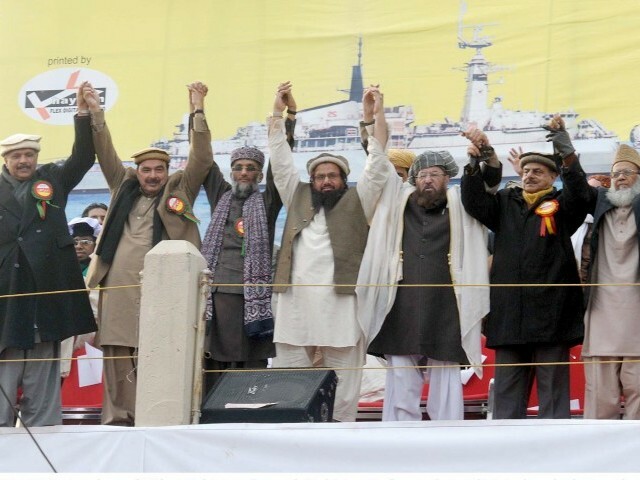 He has been an active supporter of Difa-e-Pakistan Council (DPC) regularly appearing on stage at its ‘Go America Go’ rallies and joining with Jamaat-ud-Dawa chief Hafiz Saeed and Amir JI Syed Munawar Hassan in warning against reopening NATO supplies through Pakistan. Only after Ambassador Sherry Rehman intervened with the American authorities was Sheikh Rashid released from detention – something most Pakistanis will not have the privilege of counting on if they find themselves in similar circumstances. There is now speculation that PTI supporters could face similar questioning by US authorities, and that Imran Khan was warned by well wishers not to travel to the US for a planned fundraising tour that included a $5,000 per person luncheon. 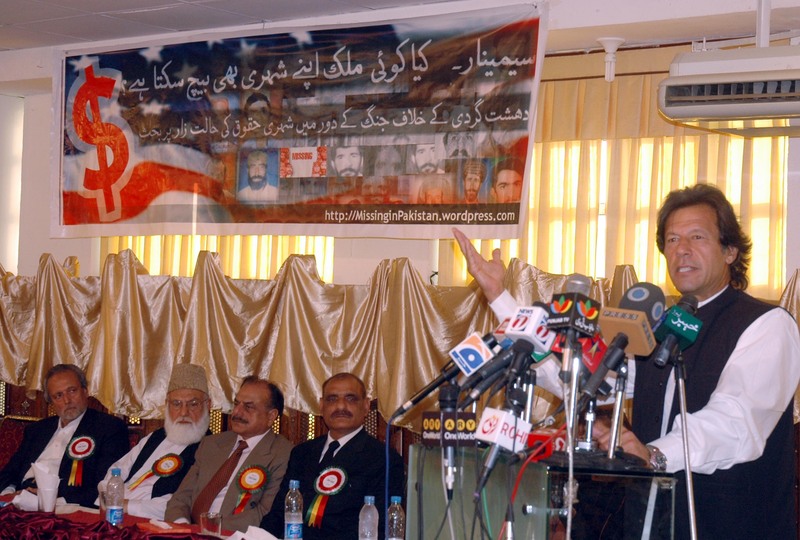 Some are concerned that Imran Khan’s ability to put on a moderate face with American media while supporting militant leaders like Hafiz Saeed and sharing the stage with pro-jihad personalities like Gen. (R) Hamid Gul at anti-American seminars. If American authorities are interested in the data on Sheikh Rashid’s phone, many wonder, are they interested in money being collected also? So far, Sheikh Rashid’s detention is being down played and treated as a possible misunderstanding. But it could be that this is the first sign of a new policy by American authorities of ‘zero tolerance’ for supporting extremist groups and projecting anti-Americanism. Is Imran Khan next? Following Zulfiqar Mirza’s unhinged ranting, another certain dust up in Islamabad gained little notice. Even though it gained mostly yawns from the anchors, it may actually have greater implications than is realised. President Zardari recently appointed Akhtar Buland Rana as Auditor General of Pakistan (AGP) on advice of PM Gilani. After the appointment was reporter, Chief Justice Iftikhar Chaudhry wrote a letter to the president expressing reservations about the appointment. The Chief Justice’s reservations were based on ISI reports he received. The CJP raised several objections against Rana in his letter citing seven charges against him. The letter alleged that Rana obtained a Canadian nationality without seeking prior permission from the government and travels abroad on three Pakistani passports and two national identification cards. It included that Rana attempted sexual assault on a subordinate woman during service and also pointed out that he did not qualify for his promotion to grade-22. The Supreme Court Registrar on Saturday said the chief justice wrote the letter to the president after the Inter-Services Intelligence (ISI) and the Federal Investigative Agency (FIA) sent their reports on Rana’s credentials. My first thought was, this is silly. The same court that is showing frustration with spy agencies manipulating the courts…are also taking dictation from the spy agencies? The court believed that the non-serious attitude of the government wasn’t a positive step towards the recovery of missing persons, adding that if spy agencies weren’t involved in their disappearances, they should submit a written statement in the court. This is also the same Chief Justice that less than five years ago submitted an Affidavit claiming that MI, ISI and IB were interfering with the Supreme Court and Chief Justice himself after Musharraf took them away from their proper duties of defending the nation and dragged them into domestic politics. Now the same Chief Justice believes spy agencies should be meddling in domestic politics? But this raises an even more important question which is why the ISI is meddling in domestic politics in the first place. Sadly, this is not a new issue, but one that continues to prevent progress. In 1988, ISI formed the right-wing Islami Jamhoori Ittehad in order to compete with the PPP – a fact admitted by former DG ISI Hamid Gul in 2009. In 2002, the ISI did it again, manipulating elections and making a mockery of the public’s wishes. This was admitted by Maj Gen Ehtesham Zamir who headed the agency’s political wing at the time. The main wheeler and dealer of the ISI during the 2002 elections, the then Maj-Gen Ehtesham Zamir, now retired, has come out of the closet and admitted his guilt of manipulating the 2002 elections, and has directly blamed Gen Musharraf for ordering so. In 2008, the newly elected PPP government closed the political wing of the ISI in hopes that the people could take back control of their own government without interference from spy agencies. Three years later and this same question is just as valid. With the threat of extremists trying to infiltrate the military, rogue ex-ISI agents running their own operations outside the control of the official agencies, and rising violence threatening the citizens, why is the ISI still spending its time meddling in domestic politics? The establishment’s narrative has always been that the military is “the only competent institution in Pakistan”. When it comes to defeating enemies o the nation, I have not a single doubt that the military is the best institution. The operations that cleared anti-Pakistan militants from Swat are proof enough. But militaries break things. They destroy them. And every time the khakis have meddled in domestic politics, they’ve broken it. Regretting his actions in 2002, Maj Gen Zamir told The News that the ISI’s meddling “had pushed the country back instead of taking it forward”. The solution is easy. Let the military agencies do their own work fighting militants and protecting the people. And let the people do their own work of electing and running the government. Latest Abbottabad lie – How stupid do they think we are? I have to admit that I’ve been a bit skeptical of the Abbottabad commission from the very beginning. It took the Americans a few hours to carry out the operation, and it has taken months for the commission to even get started. It was clear from the start that certain people didn’t want any inquiry at all. But after all this, now I’m supposed to believe that we won’t learn anything because of…America?!? According to the front page of yesterday’s Express Tribune, the US is trying to put a big foreign hand over the mouth of the Abbottabad commission. “The US was in fact strongly against the very idea of any commission to investigate the Abbottabad incident,” said a security official, who chose to stay anonymous. Of course, the American Embassy immediately rubbished such claims and Express Tribune had to publish a statement contradicting their anonymous report. But reading the original article it becomes apparent what the real problem is. Intelligence agencies have been collecting evidence and all the relevant details that could provide leads on how the world’s most recognised face managed to live undetected in a garrison town for so long, said another official. “The arrest of several local people who were working for the CIA is also helpful in finding the unanswered questions,” the official revealed. The first paragraph says that the agencies are investigation how Osama managed to live in Pakistan. The second paragraph says they are arresting local people who helped the CIA catch him. How is arresting locals who may or may not have tipped CIA in 2011 going to help us learn how Osama got here in 2005? The real issue is not how the US found him. The real issue is how Osama bin Laden got into Pakistan in the first place, and it’s the one issue nobody wants to talk about. Shireen Mazari screeches on TV about visas, but never asks who gave Osama bin Laden’s passport stamp. Ghairat Brigadiers (R, of course) give lengthy speeches about defending the national sovereignty, but they are silent about thousands of foreign jihadis are coming to our country and carrying out attacks against our own people. Taliban spokesman Ehsanullah Ehsan confesses that TTP was behind the attack on PNS Mehran, and what do I read in the newspaper? Politicians scoring cheap political points by blaming the US. When Abbottabad operation happened, what was the story from the anonymous “security officials” and Ghairat Brigadiers (R)? For weeks it was nothing because they were caught with their pants down. Then the usual parade of clowns began filling my inbox with confused and contradictory conspiracy theories. It was a joint operation and the Americans are refusing to give us our due! No, it was an invasion! They snuck in when our radars were having a rest! No, the radars were on but the hills got in the way! Osama was already dead! No, he wasn’t dead, but he did not do 9/11 attacks! No he was killed and he put up a brave fight against the imperialist bastards! No he was killed and he didn’t put up a fight because he was an innocent old man! No matter what, the problem is arrogant Amreeka! As a perfect example, Gen sahib actually managed to make all of these ridiculous statements together in less than two minutes. And now this pathetic song and dance has been followed with this latest number claiming that if we don’t learn anything from the commission, it’s not our fault, once again it’s the American’s fault! The only question for me is…how stupid do they think we are? The answer, I’m afraid, is very. Whose Side Is Hamid Gul On? Afghan news agency Tolo News reporter Shakeela Abrahimkhil wrote on Tuesday that Gen (retd) Hamid Gul has asked Mullah Omar to leave Pakistan. The reporter spoke with Afghan security officials who told that the ISI has requested Mullah Omar to leave Pakistan immediately. According to the reporter the message was conveyed by Hamid Gul. But Hamid Gul is not an active ISI officer as he retired in 1992. 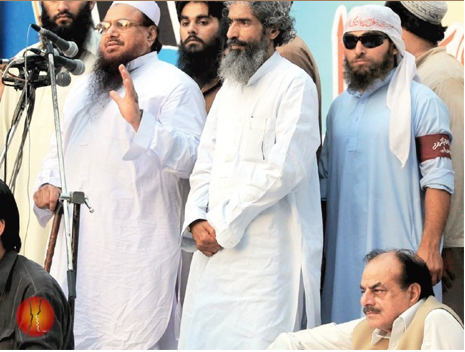 So what is Hamid Gul doing talking to Mullah Omar, and how does he maintain contacts with such wanted persons? The answer may be found in Hamid Gul’s own statements and actions. He has claimed in the past that his support for Taliban has “no physical dimension” but despite retiring in 1992 Hamid Gul has been seen and even photographed at meetings with militant leaders. Respected journalist Zahid Hussain wrote in his 2007 book “Frontline Pakistan” that Hamid Gul even attended a 2001 Darul Uloom Haqqania Islamic Conference which declared a religious duty to protect Osama bin Laden and termed the al Qaeda leader as “great Muslim warrior”. Following 26/11 attacks on Mumbai, government officials acknowledged that Hamid Gul is “godfather” of jihad in Pakistan and Gul himself even admits he is a member of Ummah Tameer-e-Nau which has been linked to al Qaeda and other terrorist groups. Hamid Gul continues to protest his innocence and say that he has no connection to militants and that he is only a simple retired man, but the photographs and news reports and even his own words tell a different story. Now the media is reporting that Hamid Gul is having direct contacts with Mullah Omar. Hamid Gul said on CNN that he has not visited an ISI office once since 1989. Therefore it means that his connections with militant groups are taken on his own and are not part of ISI or official government policy. As national policy is to fight militants, then Hamid Gul must be working against the nation. What other explanation can there be? The question then becomes whether or not we will continue to allow someone to support foreign fighters coming into Pakistan and using the country as a base of ‘strategic depth’ against US, NATO, Afghanistan or any other country. According to Al Jazeera reports is is not only against US and NATO but Taliban has declared war against Pakistan also. And this is not an idle threat being made. 100 jihadis attacked a security check point near Peshawar killing Pakistani police officers. They have declared war on Pakistan and have begun their offensive. So…Whose side is Hamid Gul on?